Birkin Lodge is located in Hawkenbury near Tunbridge Wells and is near to shops, amenities and public transport. The home provides residential, respite, and nursing care. The A21 is easily accessible. 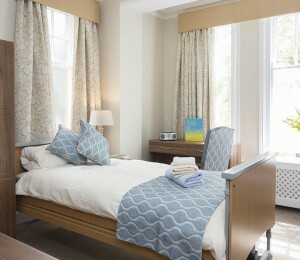 This large detached care home provides accommodation in single occupancy rooms many of which have ensuite facilities. Some rooms are spacious enough for sharing. Birkin Lodge has TV lounges and a quiet sitting room. The lounge/dining rooms, where residents can join the company of others at meal times, are also an important feature of the home. Traditional home cooked meals using fresh produce are served and there are choices daily. Special diets can be catered for. A hair stylist and a qualified chiropodist attend the home on a regular basis. Complementary therapies can be arranged to suit individual requirements. Residents can also benefit from the varied programme of activities available. Activities staff work with residents and relatives to tailor daily events in the home to the needs of residents, as well as regular excursions. ll our rooms have recently been refurbished to the highest specifications with new furniture, soft furnishings and fittings. We have designed the rooms with your comfort in mind. Your bedroom furniture consists of: an appropriate bed suitable to your needs, wardrobe, bedside table with lockable drawer, armchair and other furniture suitable to the size of the room. Your bed linen and towels are provided by the home. We understand that moving into Birkin Lodge will be a considerable transition, but one we try to make feel as easy as possible. Your room is your own personal space, which is why we encourage you to personalise it if you like, by hanging your favourite pictures or bringing small pieces of furniture.